No matter the size of your cannabis greenhouse operation, keeping your plants alive and healthy requires the best possible growing environment. This means greenhouse managers and personnel must frequently monitor the status of environmental conditions and equipment. The sooner someone discovers extreme temperature fluctuations, rising humidity or equipment failure, the more inventory you can save. That’s why integrating a remote monitoring system into your greenhouse operation can save you time, money and anxiety. Monitoring systems that use cloud-based technology let you see real-time status of all monitored conditions and receive alerts right on your mobile device. What is required to use a remote monitoring system? Most remote monitoring systems require an internet or WiFi connection and access to an electrical outlet. Programming is done through a website, so it’s easiest to use a computer for the initial setup. If you don’t have an internet connection at your location, you’ll want to choose a cellular system. Make sure that there’s sufficient signal strength at your site, and check the signal quality in the area before purchasing a cellular device. 2. How do we determine what kind of monitoring system and sensors we need? A reputable manufacturer will have a well-trained support team that can assess your needs even without a site visit to determine which products are best for your application. If you feel you need them to check out your greenhouse operation,many companies can set up a video conference or FaceTime chat to substitute for being on site. Skeletal structure of the greenhouse (metal, plastic, wood, etc.) and the covering material (glass or plastic). Floor space square footage and height of each of your greenhouses. Number of greenhouse structures in your operation. 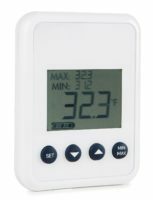 Outdoor climate to determine if you rely more on heating or air conditioning and the level of humidity control needed. Space dedicated to phases of growth (cloning and propagation, vegetative, flowering) and the microclimates needed for each. Types of lighting, ventilation and irrigation systems. Level of technological automation versus manual operation in place. The monitoring system representative will then determine the type of system that would best serve your operation, the number of base units you will need and the types of sensors required. The representative should also be able to provide tips on the placement of the sensors you’re purchasing. For example, to ensure thorough air temperature coverage, place sensors throughout the greenhouse, next to the thermostat controlling the room temperature and in the center of the greenhouse out of direct sunlight. Note that there shouldn’t be a cost for a demo, consultation or assistance throughout the sales process. Be sure to ask if there are any fees or licenses to keep using the monitoring equipment after you purchase it. 3. Are sensors included with the monitoring system? In most cases, sensors are sold separately. 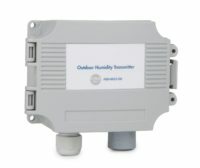 The sensors you select depend upon the conditions you want to monitor and how many you can connect to your base unit. Certainly, temperature is critical, but there are many other factors to deal with as well, such as humidity, CO2, soil moisture, water pH, power and equipment failure, ventilation and physical security. For example, humidity has a direct impact on the photosynthesis and transpiration of plants. High humidity can also cause disease and promote the growth of harmful mold, algae and mildew. 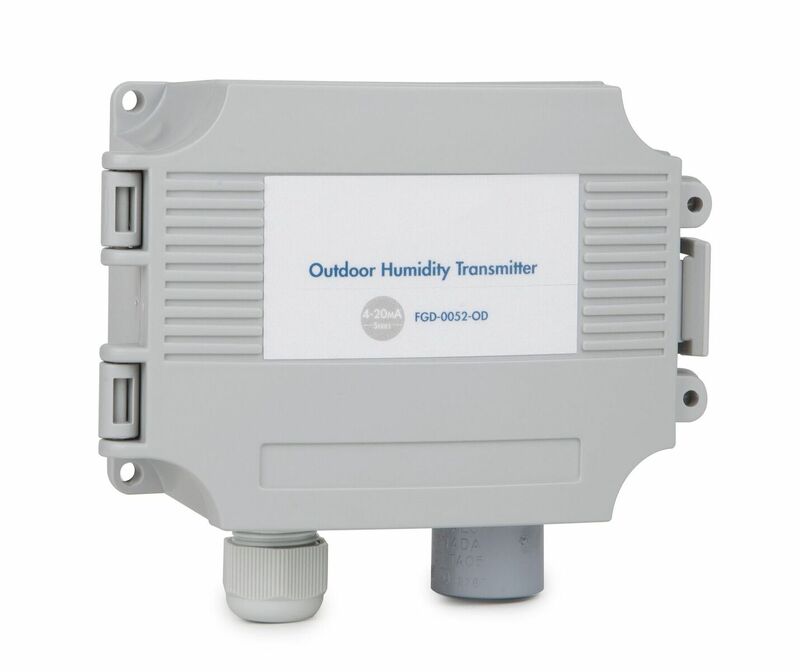 Sensors can detect changes in humidity levels. Like any other plant, cannabis needs CO2 to thrive, so it’s a good idea to include a CO2 sensor that will signal to the monitoring device when readings go out of the preset range. There are even sensors that you can place in the soil to measure moisture content to help prevent over- or underwatering, budget water usage costs, promote growth and increase crop yield and quality. Of course, all the critical systems in your growing facility—from water pumps to irrigation lines to louvers—rely on electrical power. 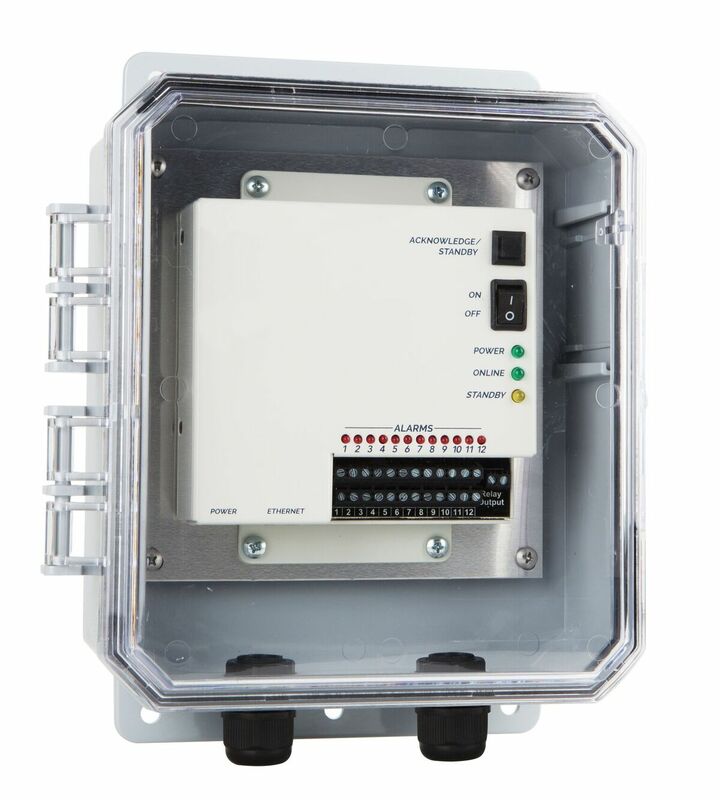 A power outage monitoring sensor detects power failure. It can also monitor equipment for conditions that predict if a problem is looming, such as power fluctuations that occur at specific times. Ventilation systems not only help control temperature, they also provide fresh air that is critical to plant health. Automated systems include features like vented roofs, side vents and forced fans. Sensors placed on all these systems will send personnel an alert if they stop running or operate outside of preset parameters. To monitor the physical security of your greenhouses, you can add sensors to entrance doors, windows, supply rooms and equipment sheds. During off hours, when no staff is on duty, you can remain vigilant and be alerted to any unauthorized entry into your facility. 4. Do monitoring systems only work with the manufacturer’s sensors? Not necessarily. 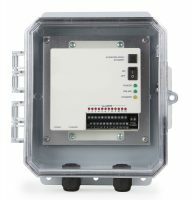 For example, certain monitoring units can connect with most 4-20mA sensors and transmitters regardless of the brand. 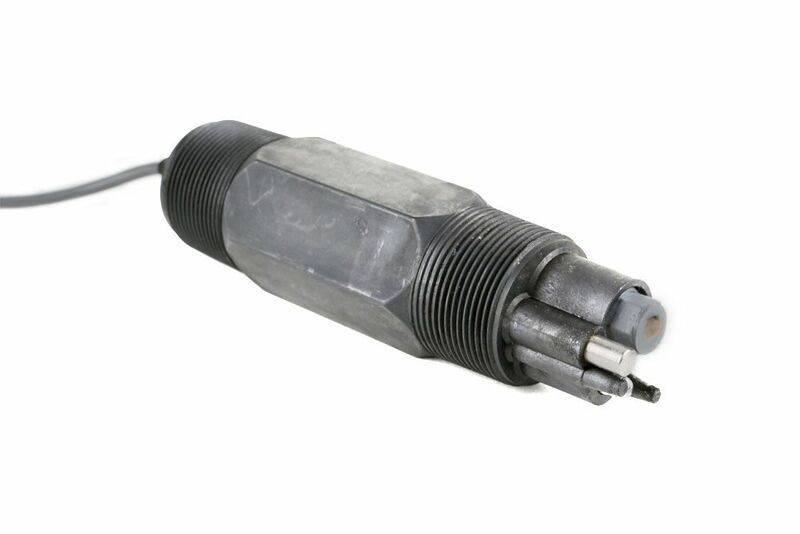 When selecting sensors, you might have a choice between ones that are designed by the manufacturer to work specifically with the monitoring system or universal components made by a third party. If the components aren’t made by the system manufacturer, you’ll want to find out if they have been tested with the monitor you are choosing and if you need to work with another vendor to purchase the parts. 5. Is a monitoring system easy to set up, or do we need to hire an electrician? You connect the sensors to the base unit’s terminal strip using wire, which is included with many sensors. The range of many wired sensors can be extended up to 2,000 feet away from the base unit by adding wire that can be easily purchased at any home store. It’s a good idea to hire an electrician if you need to run wires through walls or ceilings. Usually, once you plug in the device and connect the sensors, you then create an account on the manufacturer’s designated website and begin using your device. There should be no fee to create an account and use the site. If the manufacturer doesn’t offer installation services, ask if they can recommend a local representative in your area who can set up your system. If not, make sure they provide free technical support via phone or email to walk you through the installation and answer any questions you might have about programming and daily usage. 6. Is there a monthly fee to access all the functionality of a monitoring device? Many web- or cloud-based systems provide free functionality with some limitations. You might have to purchase a premium subscription to unlock features such as text messaging, phone call alerts and unlimited data logging access. 7. Should we get a system that is wired or wireless? Will we need to have a phone line, cable, internet or something else? Wireless can mean two different things as it relates to monitoring: how the system communicates its data to the outside world and how the sensors communicate with the system. The most popular systems require an internet or WiFi connection, but if that’s not an option, cellular- and phone-based systems are available. A hardwired monitoring system connects the sensors to the base device with wires. A wireless system uses built-in radio transmitters to communicate with the base unit. Some monitoring systems can accommodate a combination of hardwired and wireless sensors. 8. Can one system monitor several sensor inputs around the clock? Once the monitoring system is installed and programmed, it will constantly read the information from the sensors 24/7. Cloud-based systems have data logging capabilities and store limitless amounts of information that you can view from any internet-connected device via a website or app. If the system detects any sensor readings outside of the preset range, it will send an alarm to all designated personnel. The number of sensors a base unit can monitor varies. Make sure to evaluate your needs and to select one that can accommodate your present situation and future growth. When a monitoring system identifies a change in status, it immediately sends alerts to people on your contact list. If you don’t want all your personnel to receive notifications at the same time, some devices can be programmed to send alerts in a tiered fashion or on a schedule. Multiple communications methods like phone, email and text provide extra assurance that you’ll get the alert. It’s a good idea to check the number of people the system can reach and if the system automatically cycles through the contact list until someone responds. Some systems allow for flexible scheduling, so that off-duty personnel don’t receive alerts. 9. Do monitoring systems have a back-up power system that will ensure the alarming function still works if the power goes out or if someone disconnects the power? The safest choice is a cloud-based system that comes with a built-in battery backup that will last for hours in the event of a power failure. Cloud-based units constantly communicate a signal to the cloud to validate its online status. If the communication link is interrupted—for example by a power outage or an employee accidently switching off the unit—the system generates an alarm indicating that the internet connection is lost or that there is a cellular communications problem. Users are alerted about the disruption through phone, text or email. All data collected during this time will be stored in the device and will be uploaded to the cloud when the internet connection is restored. If you opt for a cloud-based monitoring system, make sure the infrastructure used to create the cloud platform is monitored 24/7 by the manufacturer’s team. Ask if they have multiple backups across the country to ensure the system is never down. 10. What should we expect if we need technical support or repairs to the system? Purchase your system from a reputable manufacturer that provides a warranty and offers full repair services in the event the product stops working as it should. Also, research to make sure their tech support team is knowledgeable and willing to walk you through any questions you have about your monitoring system. Often, support specialists can diagnose and correct unit setup and programming issues over the phone. It helps to record your observations regarding the problem, so the tech team can look for trends and circumstances concerning the issue and better diagnose the problem. Ideally, the manufacturer can provide loaner units if your problem requires mailing the device to their facility for repair. Controlling the environmental parameters of the indoor farm is essential to managing the productivity and health of your crop. This presentation will discuss the critical roles that VPD, airflow, CO2, and other parameters play in the dynamic indoor environment, and we will review different systems and strategies you can use to manage them. A project case study will be presented to demonstrate the costs associated with different climate management (HVAC) alternatives, including first cost, operating cost, maintenance, and crop productivity. As the cannabis industry in the United States and throughout the world develops, the market is getting more competitive. Markets in a number of states are experiencing disruptions that will have lasting effects for cultivators, including oversupply and supply chain bottlenecks. Now more than ever, growers need to look for ways to differentiate their product or gain a bigger market share. Looking at yield efficiency, quality improvements and analyzing the cost of inputs versus value of the crop can help growers make the right choices in technology for lighting, irrigation and pest control among other technologies. A series of free webinars in two weeks can help growers learn about some of the more advanced techniques in improving yield and quality. 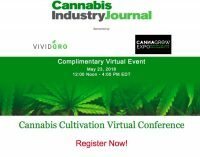 The Cannabis Cultivation Virtual Conference on May 23rd will explore a variety of tips and tricks for taking their cultivation operation to the next level. This event is free to attendees, made possible by sponsors VividGro and CannaGrow Expo. Attendees will hear from experts in cannabis cultivation on a range of topics, including breeding, drying, curing, environmental monitoring and micropropagation. 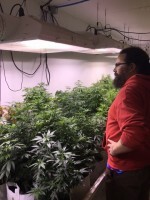 Adam Jacques, co-founder of Growers’ Guild Gardens and Sproutly, will discuss some of his experience with breeding high-CBD strains in Oregon. His talk will delve into some of the proper breeding procedures, along with how to hunt for particular phenotypes and developing specific cannabinoids and terpenes. Dr. Allison Justice, vice president of cultivation at Outco, is going to present some of her findings in drying and curing at the company. She plans on sharing her research on how the post-harvest stages can affect and control the chemical makeup of flower. 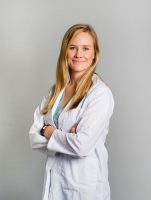 She’ll also discuss some new protocols to monitor the dry and cure of cannabis flowers so we are able to modulate the terpene and cannabinoid profiles. More information on the other speakers at this event and how to register for free can be found here. Recorded 5/23/18 – 4 hours 50 minutes – 5 presentations on growing techniques in 1 Day, all from the comfort of your home or office. 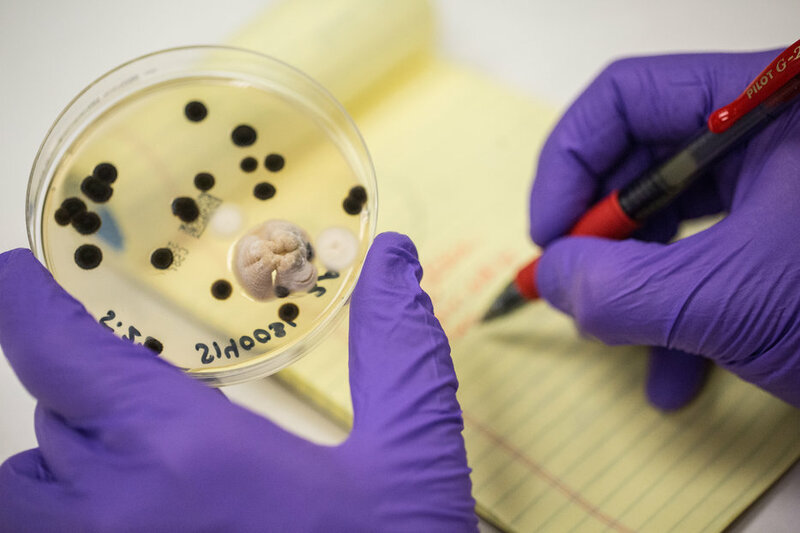 Learn about Breeding, Drying, Curing, Environmental Monitoring, Lighting and Tissue Culture. Hear from industry experts such as Adam Jacques, Dr. Allison Justice, Dr. Nadia Sabeh and Dr. Hope Jones. 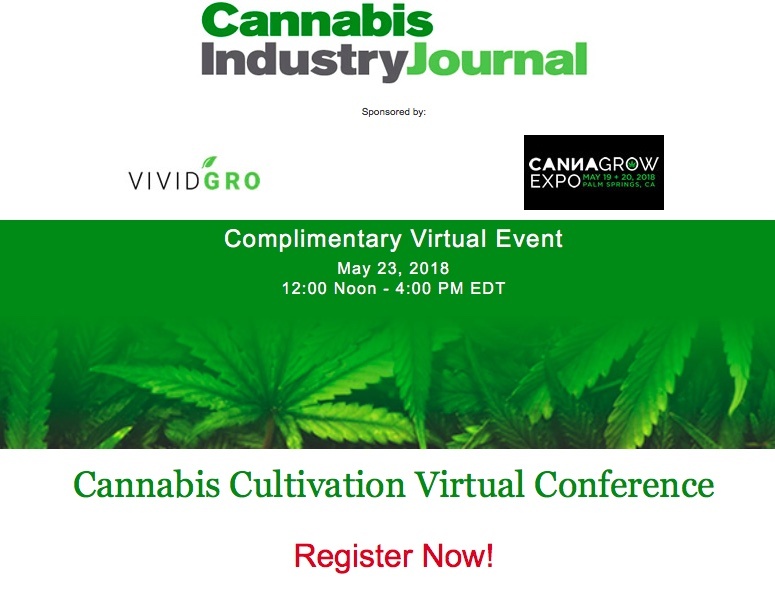 This online event is brought to you by VividGro, CannaGrow Expo and CannabisIndustryJournal.com. Controlling your grow environment doesn’t start when you germinate your first seeds, it starts before you build your grow. There are steps you can take that will have a significant impact on mold growth and contamination, and these will vary based on the grow environment you choose. Below is a roadmap to where each grow environment stands in terms of mold and contamination risk, and simple steps you can take to mitigate these factors. 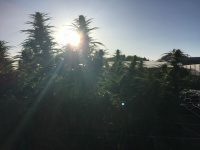 The benefits of an outdoor grow are significant – using natural sunlight to grow plants is both inexpensive and environmentally sound. However, it allows the least amount of control and makes plants susceptible to weather conditions and outdoor contaminants including dust, wind, rain and insects. Depending on humidity and precipitation levels, mold can be a big issue as well. When selecting an outdoor area for a cannabis farm, there are two important factors to consider: location and neighboring farmland. Geographical environments and sub-climates vary and once you have purchased land, you are committed, so be sure to consider these factors prior to purchase. While arid desert climates have abundant sunlight and long growing seasons, flat, dry lands are subject to dust-storms, flash floods and exceedingly high winds that can damage crops. Conversely, more protected areas often have high humidity and rainfall late in the season, which can create huge issues with bud rot and mold. Neighboring farms also have an impact on your grow, so be sure to find out what they cultivate, what they spray, their harvest schedule and how they run their operation. Large farming equipment kicks up a lot of contaminant-laden dust and can damage crops by displacing insects to your farm if they harvest before you. Pesticide drift is also a major issue as even tiny amounts from a neighbor’s farm can cause your crops to fail testing, depending on what state you are in. With outdoor grow environments always at the mercy of Mother Nature, any cultivator is wise to control contamination potential on the ground. Cover soil and protect your crop by planting cover crops and laying plastic mulch on as much ground as reasonable. In many cases it makes sense to irrigate uncultivated parts of your farm just to keep dust down. Greenhouses are the future of cannabis cultivation. They allow growers to capture the full spectrum and power of the sun while lessening environmental impact and operating expenses, while still being able to precisely control the environment to grow great cannabis. With recent advancements in greenhouse technology such as automated control systems, positive pressure, geothermal heating or cooling and LED supplemental lighting, greenhouses are the future. However, older or economy greenhouses that take in unfiltered air from outside still have a medium amount of mold and contamination risk. Before building your greenhouse, study the area while taking into account climate, weather conditions and sun exposure. Excessively windy areas can blow in contaminants, and extremely hot climates make cooling the greenhouse interior a challenging and costly endeavor. There are several simple operational tactics to reduce contaminants in a greenhouse. Add a thrip screen to keep insects out, thoroughly clean pad walls with an oxidizing agent after each cycle, and keep plants at least 10 feet from pad walls. Plan to flip the entire greenhouse at once so that you can clean the greenhouse top to bottom before your next crop. 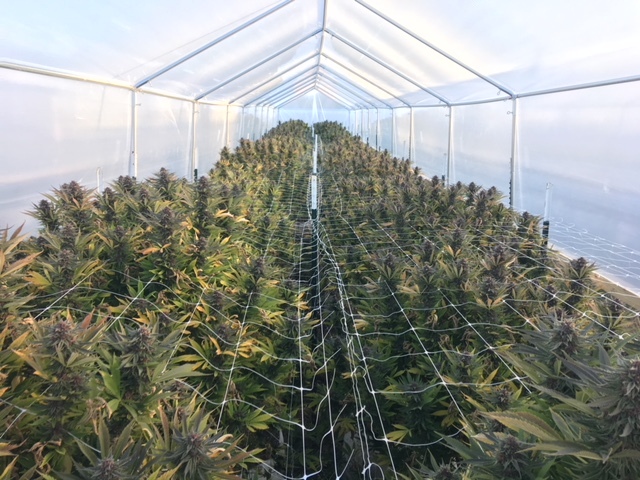 A continuous harvest in your greenhouse allows contaminants to jump from one plant to the next and reduces the ability to control your environment and eliminate problems at the end of a cycle. Lastly, open shade curtains slowly in the morning. This prevents temperature inversion and condensation, which can cause water drops to fall from the ceiling and transfer contaminants onto plants below. 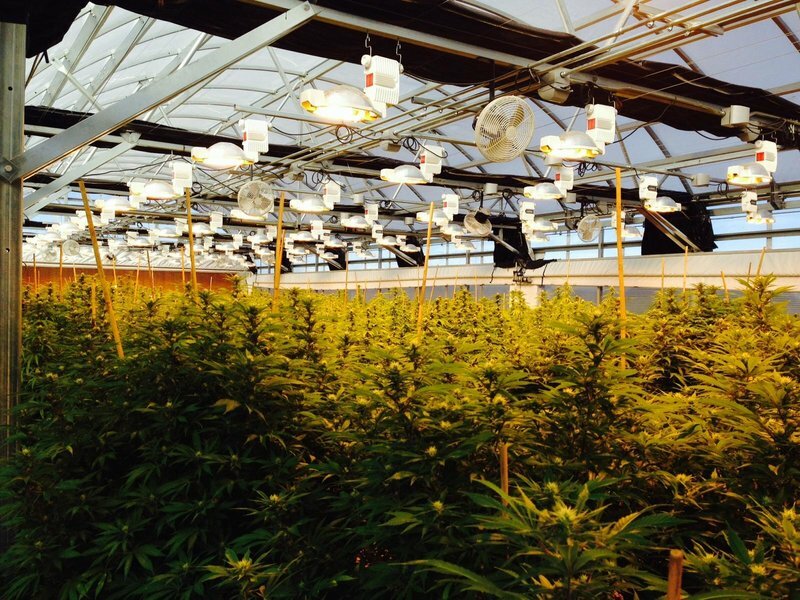 An indoor environment offers ultimate control to any grow operation. Cultivators can grow high-quality cannabis with the smallest potential for yeast and mold growth. Unfortunately, indoor environments are extremely expensive, inefficient and environmentally costly. 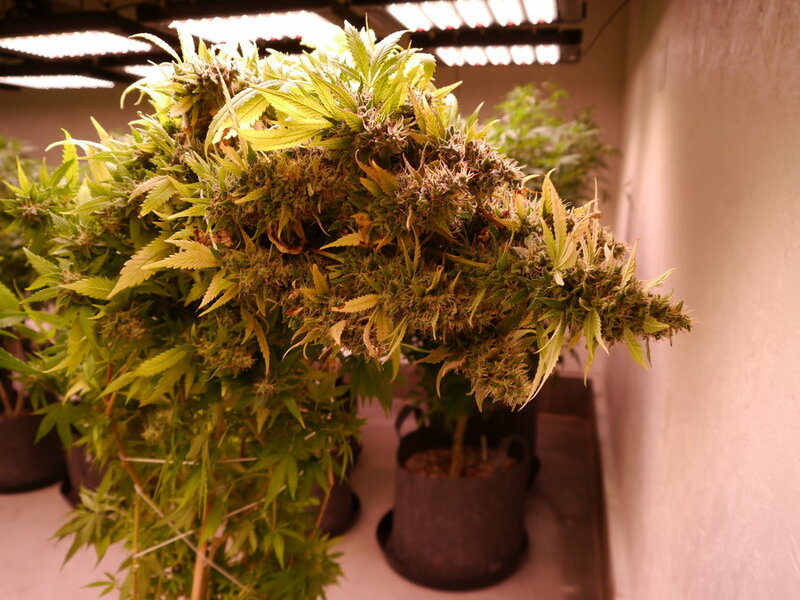 With indoor grow environments, keeping mold and contaminants at bay comes down to following a regimented plan that keeps all grow aspects clean and in order. To keep your grow environment clean, change HVAC filters multiple times a month. It’s also important to install HEPA filters and UV lights in HVAC systems to further reduce contamination threats. Clearly mark air returns if they are near the ground and keep those areas free of clutter. They are the lungs of your grow. Also, stop using brooms in the grow space. They stir up a lot of contaminants that have settled to the floor. Instead, use HEPA filter backpack vacuums or install a central vacuum system. Set up a “dirty room” for anything messy on a separate HVAC system, and be sure to thoroughly clean pots after every harvest cycle. Learn more about reducing mold and contaminants in an indoor or greenhouse grow in another article from our series: 10 Ways to Reduce Mold in Your Grow. Regardless of whether your grow is indoor or in a greenhouse, mold is a factor that all cultivators must consider. After weeks of careful tending, pruning and watering to encourage a strong harvest, all cultivators are looking to sell their crop for the highest market value. A high mold presence, measured through a total yeast and mold count (TYMC), can cause a change of plans by decreasing crop value. But it doesn’t have to. Isolate dirty tasks. If you are cleaning pots, filling pots or scrubbing trimming scissors, keep these and other dirty tasks away from grow and process areas. Dirty tasks can contaminate the grow area and encourage mold growth. Set up a “dirty room” that does not share heating, ventilation and air conditioning with clean areas. Compartmentalize the grow space. Mold can launch spores at speeds up to 55 miles per hour up to eight feet away without any air current. For this reason, if mold growth begins, it can become a huge problem very quickly. Isolate or remove a problem as soon as it is discovered- better to toss a plant than to risk your crop. No drinks or food allowed. 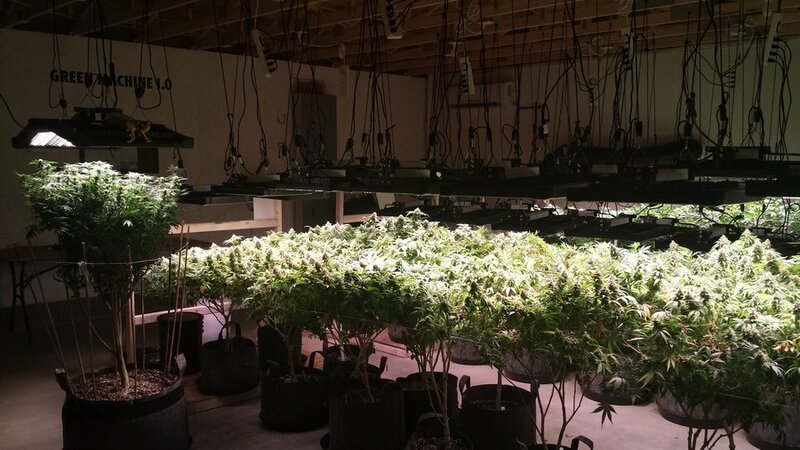 Any drinks or food, with the exception of water, are completely off limits in a grow space. If one of your employees drops a soda on the ground, the sugars in the soda provide food for mold and yeast to grow. You’d be surprised how much damage a capful of soda or the crust of a sandwich can do. Empty all trash daily. Limiting contaminants in turn limits the potential for issues. This is an easy way to keep your grow clean and sterile. Axe the brooms. While a broom may seem like the perfect way to clean the floor, it is one of the fastest ways to stir up dirt, dust, spores and contaminants, and spread them everywhere. Replace your brooms with hepa filter backpack vacuums, but be sure that they are always emptied outside at the end of the work day. No standing water or high humidity. Mold needs water to grow, therefore standing water or high humidity levels gives mold the sustenance to sporulate. Pests also proliferate with water. Remove standing water and keep the humidity level as low as possible without detriment to your plants. Require coveralls for all employees. Your employee may love his favorite jean jacket, but the odds are that it hasn’t been cleaned in months and is covered with mold spores. Clean clothing for your staff is a must. Provide coveralls that are washed at least once a week if not daily. Keep things clean. A clean and organized grow area will have a huge impact on mold growth. Clean pots with oxidate, mop floors with oxidate every week, keep the areas in front of air returns clean and clutter-free, and clean floor drains regularly. The entire grow and everything in it should be scrubbed top to bottom after each harvest. Keep it cool. Keep curing areas cool and storage areas cold where possible. The ideal temperature for a curing area is roughly 60 degrees and under 32 degrees for a storage area. Just like food, the lower the temperature, the better it keeps. High temperature increases all molecular and biological activity, which causes things to deteriorate faster than at cooler temperatures. However, curing temperature is a function of water activity more than anything. Be Careful With Beneficials. Beneficial insects certainly have their place in the grow environment. However, if you have a problem with mold on only a small percentage of plants, any insect can act as a carrier for spores and exacerbate the problem. By the same token, pests spread mold more effectively than beneficials because they produce rapidly, where beneficials die if there aren’t pests for them to eat. It is best to use beneficials early in the cycle and only when necessary. Maintaining an environment that supports cultivation and keeps plants healthy is not an easy task. In cannabis growing, there are a variety of factors that greenhouse managers and personnel must monitor to ensure that their plants are in a healthy environment that fosters growth and development. Temperature, humidity, lighting and CO2 levels are a few of the conditions that need to be tailored to each cannabis greenhouse operation. However, it can be difficult to constantly monitor the status of your equipment and the greenhouse environment, especially after hours or during the off-season. A remote monitoring system that’s properly selected and installed can help greenhouse managers keep their cannabis plants healthy, multiply their yields and increase return on investment. This type of system also helps operators identify patterns and trends in environmental conditions and get insight into larger issues that can prevent problems before they arise. 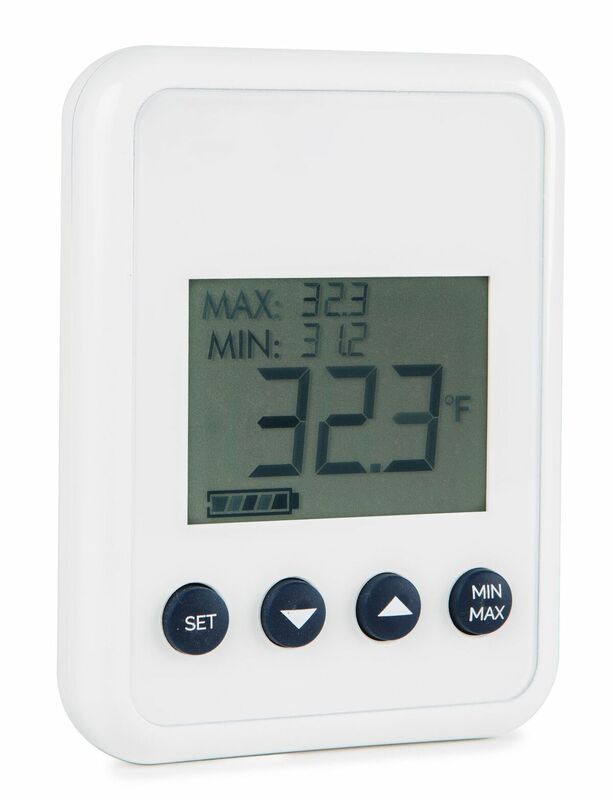 Temperature plays a crucial role in any cannabis grow operation. The climate in your greenhouse must be warm enough to nurture photosynthesis and the growth of cannabis plants. Setting the incorrect temperature will significantly impact the potential yield of the plant and the rate at which it develops. A temperature too low will slow the growth of the cannabis, but too hot can lead to heat stress for your plants. The ideal temperature for a standard greenhouse is between 70 and 80 degrees Fahrenheit. However, depending on the stage of plant and desired growth densities, the temperature of the greenhouse needs to be adjusted accordingly. Humidity directly affects plant photosynthesis and transpiration, so controlling humidity is vital in greenhouse growing. The ideal relative humidity (RH) for cannabis growth is around 60%. A low humidity level can cause water to evaporate too quickly for photosynthesis, while a humidity level that is too high can cause poor growth and possible mold and fungal disease. Monitoring the moisture content in the air of your greenhouse will help the plants during the transpiration process, increasing absorption of nutrients and overall health of the cannabis. Your cannabis may be getting an abundance of natural light during the summer months, but maintaining adequate sunlight during the winter months can be a challenge. As a solution to this, many greenhouse managers equip their facilities with additional lights to supplement natural light during off-seasons or off-hours. To achieve the best possible yield, a cannabis plant in the budding stage should receive twelve hours of light each day, while other stages could require additional lighting. For example, the growth stage could require your cannabis to be exposed to sunlight for up to eighteen hours a day. Like any other plant, cannabis requires CO2 to breathe. Greenhouse managers must set and monitor the CO2 levels in their facility to make sure that there is an adequate amount for the plants to develop, grow and be healthy. The amount of carbon dioxide required for your cannabis depends of the size of the facility and the amount of light the plants are receiving. However, a standard grow area for cannabis can maintain a CO2 range from 1000 to 1500 parts per million (PPM). A level below that threshold can result in slower growth of the plants, while a level above would lead to unused and wasted CO2. One way to ensure a good yield from your cannabis is to water it regularly and monitor your soil moisture. Overwatering your plants can have the same effect, if not worse, than letting the soil become too dry. Plants’ roots need oxygen to survive, unlike leaves that breathe CO2, and when the soil is waterlogged the roots can’t provide their function. The lack of oxygen interferes with the roots’ nutrient uptake and photosynthesis causing the cannabis plant to wilt. The exact moisture content of the soil depends on the size of your greenhouse, temperature and humidity. Whether you hand water or are using a drip irrigation system, being aware of your soil moisture is vital to the long-term health of your cannabis. Your greenhouse environment should mimic the ideal conditions in which cannabis plants flourish. With an indoor facility, you have the ability to control air circulation by venting hot air out and blowing fresh air in. Creating a circulation of air inside your greenhouse will increase your cannabis plant’s growth speed and yield. Additionally, an exhaust system helps control the temperature and humidity, while also preventing the invasion of mold and pests that thrive in hot, stagnant air. When growing something of value, like cannabis, there will always be a threat of intruders. Whether your greenhouse is in a populated area or around hungry wildlife, any intruder could be detrimental to your overall yields and profit. Remote monitoring systems can give you peace of mind and instantly alert you when there is an unwanted presence in your greenhouse. Knowing all the possible threats to your cannabis greenhouse helps you evaluate your specific needs, and ultimately identify the proper remote monitoring system. Each condition in your greenhouse that you want to monitor requires its own input on the base unit of the monitoring system. You must match your needs with the number of inputs available. A good fit for a smaller cannabis greenhouse may be a lower-cost, non-expandable monitoring system. However, larger facilities have many monitoring points and more people to alert when there’s a problem. If your cannabis operation is poised for growth, purchasing an expandable system could add value to the initial purchase because you wouldn’t have to replace your entire system in the future. Your monitoring system should also have an internal rechargeable battery backup to ensure continuous monitoring and alerts in the event of a power outage. It is also recommended to have each base unit in a sheltered enclosure to protect it from moisture, dirt and other hazards. Placement of sensors is also crucial. For example, temperature sensors in your greenhouse should be placed throughout the facility. They should be next to your thermostat and in the center of your greenhouse, preferably away from direct sunlight. Remote monitoring systems offer the option to have sensors hardwired directly to the base unit or sensors wirelessly connected. A hardwired monitoring system connects the sensors to the base device with wires. Generally, trenching long distances for wires is time consuming and costly. So alternatively, a wireless system uses built-in radio transmitters to communicate with the base unit. Some monitoring systems can accommodate a combination of hardwired and wireless sensors. Monitoring devices that use cellular communications must be registered on a wireless network (like Verizon or AT&T) before you can send or receive messages. Because cellular devices perform all communications over a wireless network, it is important that there be sufficient signal strength at the greenhouse. It is a good idea to check the signal quality in the area before purchasing a cellular product. If the cellular network has less than desirable coverage, it is possible to install an external antenna to help increase cellular signal. When monitoring systems identify a change in status, they immediately send alerts to people on the contact list. If you don’t want all of your personnel to receive notifications at the same time, certain devices can be programmed to send alerts in a tiered fashion. It is important to consider the reach of the communications, so that you’ll be notified regardless of your locations. Multiple communications methods like phone, email and text provide extra assurance that you’ll get the alert. Also, note of the number of people the system can reach and if the system automatically cycles through the contact list until someone responds. Make sure the system allows for flexible scheduling so that it doesn’t send alarms to off-duty personnel. If you’re responsible for maintaining a commercial greenhouse facility, you want a system that will provide real-time status of all monitored conditions on demand. There are a few different ways to access your sensor readings. Options include calling to check status, viewing a web page, either on a local network or on the cloud, or accessing the information via an app on your mobile device. With a cloud-based system, the devices supervise themselves. This means if the internet or cellular connection goes down, the device will send an alarm to alert the appropriate personnel. If you don’t select a cloud-based system, you will be limited to logging in through a local area network, which will allow you to make programming changes, access status conditions and review data logs. If internet connectivity is not available at your location, you will want to choose a cellular or phone system rather than Ethernet-based option. 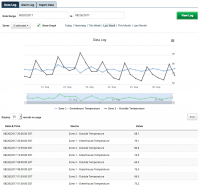 Data history is valuable in identifying patterns and trends in your cannabis greenhouse conditions. Manually monitoring and recording environmental parameters takes a significant amount of personnel time and detracts from other important workplace demands. However, many monitoring systems automatically save information, recording tens of thousands of data points, dates and times. 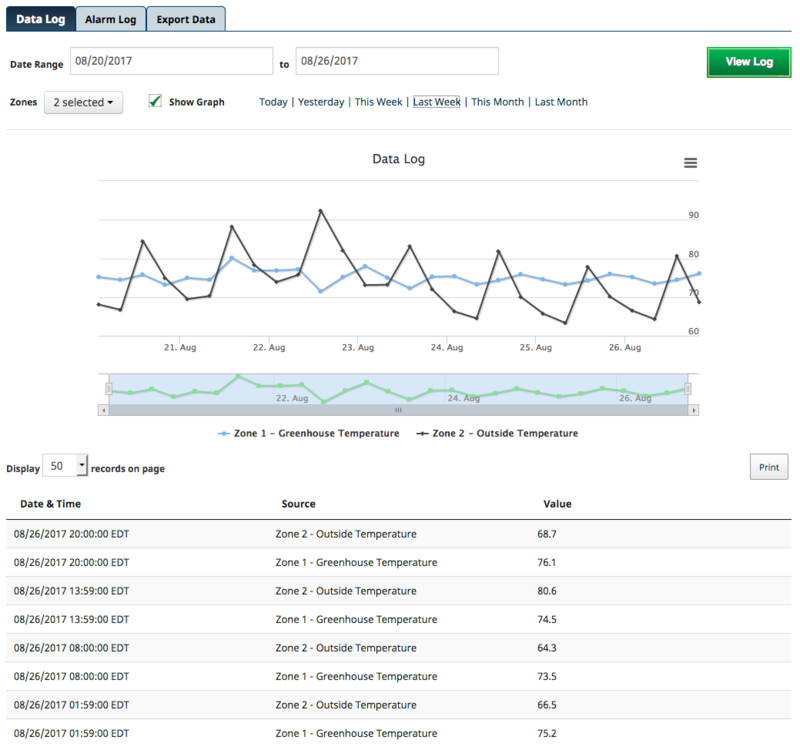 Cloud-based logging provides an unlimited number of records for users to view, graph, print and export data trends. Analyzing data samples may lend insight to larger issues and prevent problems before they arise. For example, if the data log shows power fluctuations occurring at a regular time, it could be indicative of a more serious problem. Or, if the data shows signs of a ventilation fan or supplementary lighting beginning to malfunction, they can be repaired or replaced before total failure occurs. When deciding how much you should pay for a remote monitoring system, tally up the entire cost, fully installed with additional peripherals and sensors and any labor fees for installation. Then consider the value of your cannabis plant inventory and greenhouse equipment. Finally, factor in the cost of downtime, should an environmental event shut down your operation for a period of time. Choosing the right greenhouse monitoring system and sensors could mean the difference between life and death for your cannabis plants. Understanding the conditions you need to watch and monitoring systems’ capabilities are they best way to protect your investment. 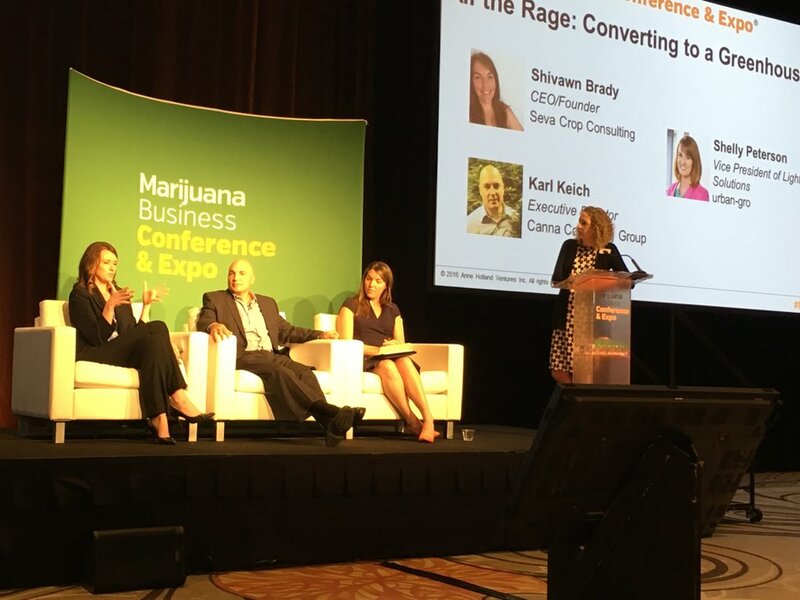 Shelly Peterson, vice president of light product solutions at urban-gro, joined a recent panel of industry experts including Shivawn Brady, chief executive officer and founder of Seva Crop Consulting, and Karl Keich, executive director at Canna Consulting Group, at the Marijuana Business Conference in Orlando, Florida, to discuss how to transition from an indoor or outdoor grow to a greenhouse facility. What are the considerations when deciding between a warehouse and greenhouse? The panel shares four factors around the costs and operational challenges, and the benefits of a greenhouse. 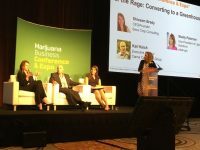 The panel at the Marijuana Business Conference. 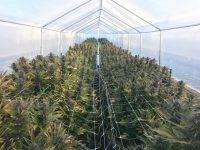 For cultivators, Peterson noted that it is critical to ensure growers have experienced vendors and advisors on the team to help maximize the efficiency of the greenhouse. “As the cost of this product comes down, the efficient growers will be the ones in it for the long haul,” added Peterson. A greenhouse facility that urban-gro helped bring to operation. One of the greatest benefits of growing in a greenhouse is the ability to source natural light. But what about the required light levels? Peterson pointed out that light levels change throughout the year and the plants have different light needs in different stage. Supplement with a lighting system that can read the natural light levels received over any given period of time and be adjusted accordingly. “Greenhouse facilities also need to be outfitted to meet the needs of the cannabis plant, which differ in some ways from other agricultural crops,” says Peterson. Brady noted that industry leaders are conscious of positive impact towards human health and environmental stewardship when moving to a greenhouse. Cultivators may find the process challenging initially, however the facilities are quite easy to operate and manage, and allow stress-free cultivation of commercial-scale crops. Keich added that the cannabis industry is becoming more like commercial agriculture. By utilizing the correct technologies and regulators, greenhouse cultivation makes the crop smell, taste and look that much better. “Let’s use natural sunlight to minimize costs and be environmentally friendly to produce a superior product,” says Keich. Peterson wrapped up by stressing that cultivators should evaluate the greenhouse environment and lighting to improve their bottom line. “Look at the most efficient way to lower your cost of goods sold. Lighting is a very big component to that,” she continued. “Make sure you evaluate the efficiency of the fixture and ask the questions: Why are we targeting this light level? Is the color spectrum correct? Are you measuring in micromoles per watt? These are all different questions, however figure out how much light is coming out of the fixture and verify it for yourself, and you will be successful,” says Peterson. The preferred choice for indoor cannabis growing has long been high-pressure sodium (HPS) 1000-watt light bulbs during flowering. Light-emitting diodes (LED) are quickly changing the indoor farming landscape with innovative technologies and promising energy savings. Many think the technology still needs time to develop. There are certainly many pros and cons to switching an indoor cultivation facility from HPS to LED lighting systems. Steve Kruss, president of Light-Waves Electronics, Inc., gave a comprehensive analysis of the advantages and disadvantages of various light sources at the CannaGrow Conference and Expo. “The first adopters [of LED light technology] more than two years ago did not get the results they wanted, so many growers gave them a bad rap very early on,” says Kruss. His discussion delved into the pros and cons of both LED and HPS lights in growing cannabis. Light-Waves Electronics Inc. 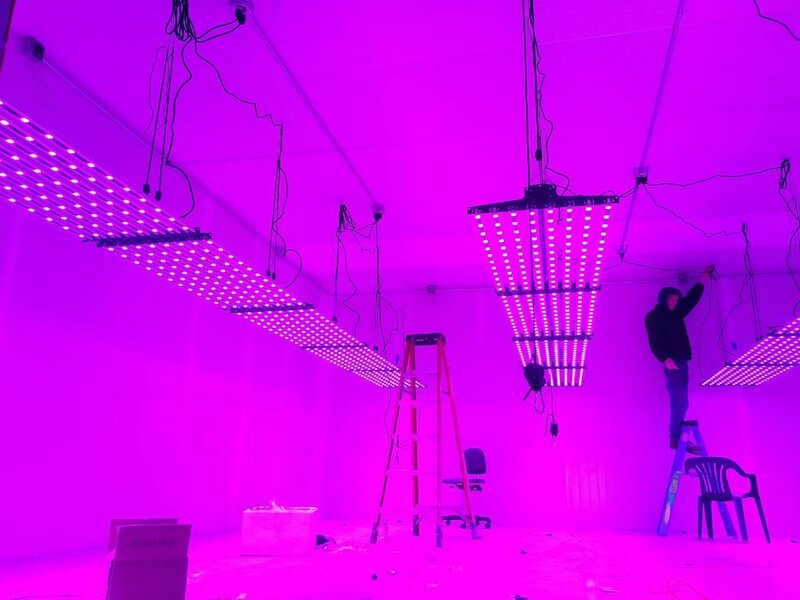 LED fixtures being installed in a cultivation facility. It is important to highlight the weaknesses in many common HPS systems and the possible solutions that LED technology could offer. According to Kruss, HPS lights do not match the light spectrum’s photosynthesis curve that plants need to absorb energy. 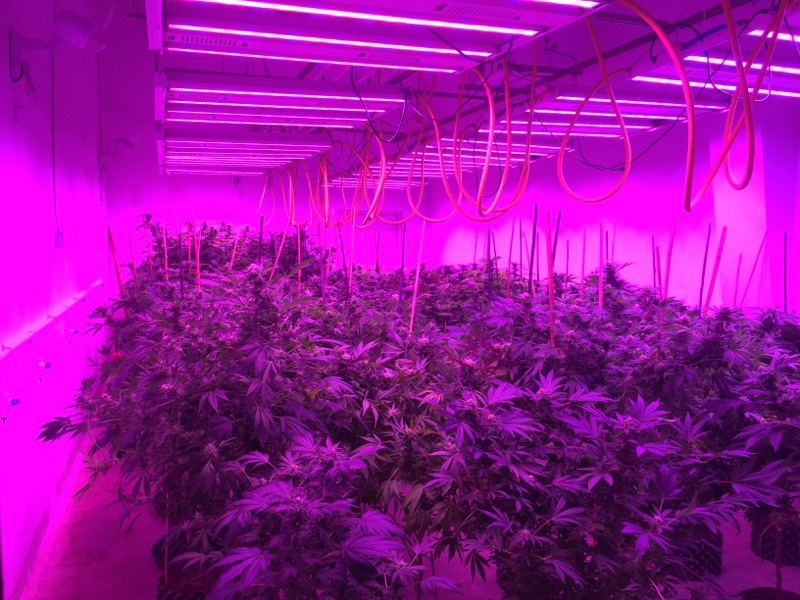 HPS lights give off a tremendous amount of heat that requires more energy to cool a facility down with an HVAC system, increasing energy costs for growers. Since LED’s use 50% less wattage, they produce approximately 50% less heat, significantly reducing cooling costs. HPS light bulbs need to be replaced multiple times per year. Quality LED fixtures can last more than 50,000 hours, or roughly eleven years. “The reality is HPS is putting a lot of light out but that energy is wasted because so much of it is in a light spectrum that plants do not absorb,” says Kruss. 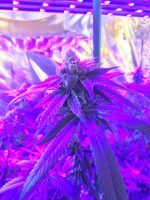 Perhaps most important is the lack of ability to vary the light spectrum; any light that HPS bulbs produce that the plant does not absorb is essentially wasted energy. LED light bulbs provide a solution to the wasted light in HPS by targeting the particular spectrum that plants need for photosynthesis. By targeting the photosynthetically active radiation (PAR), roughly 400-700nm, LEDs can effectively mimic the sun’s ability to produce the wavelength of light specifically needed in a certain stage of cultivation. The absorption spectra and action spectra are wavelengths of light preferable for harvest as well as plant growth and metabolism, respectively. LED manufacturers and growers commonly try to harness the Emerson Effect, which uses red (670nm) and far red (700nm) to increase the rate of photosynthesis. The benefits of LED lights in growing cannabis are numerous. The primary benefit is that it provides light at the specific wavelengths chosen to match the specific needs of plants. When finely tuned, LEDs can influence the growth process by slowing down vegetative plant growth and inducing flowering when appropriate. LEDs are more energy efficient than their counterparts partially because they give off substantially less heat in the beam itself, reducing cooling costs. Some growers use LEDs together with HPS lights, some use LEDs with natural sunlight in a greenhouse setting and some use strictly LEDs for the entire growth cycle. Each cultivation operation has its own budgetary restraints and structural limitations, but energy efficiency is one area that all growers should look to improve. 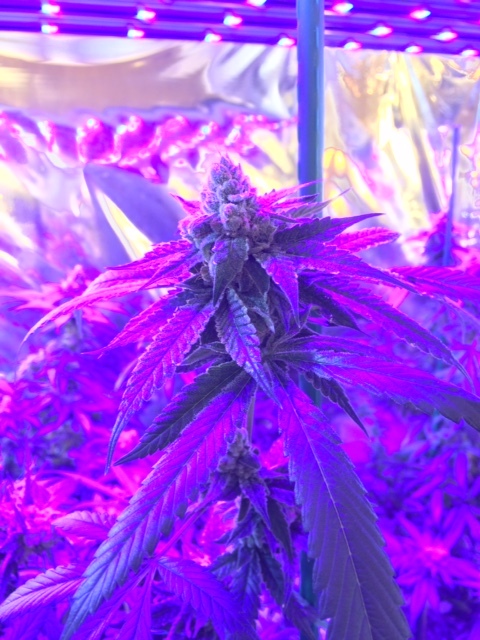 According to Adam Koh, chief cultivation officer of Comprehensive Cannabis Consulting (3C), indoor growers can get away with T5 fluorescent lamps (which do not consume much energy) throughout the vegetative process. For some, the debate is over and growers recognize the added benefits that LEDs bring to growing cannabis. According to Kruss, LED technology is almost there. “In terms of yields, LED lights are providing around 75% of the weight that HPS produces, but on the vegetative side, the growth is considerably faster which could make up for that weight loss with faster grow cycles and an extra harvest,” says Kruss. Adam Jacques, award-winning grower and founder of Growers’ Guild Gardens, has used LEDs in tandem with sunlight. Him and his team have bred and grown cannabis in indoor, greenhouse and outdoor operations. “I love the huge steps that some LED manufacturers have made in the past year,” says Jacques. “When I utilize them within a greenhouse setting I really like the product it grows.” Jacques’ findings in the field echo Kruss’ statements that LED lights have made considerable progress very recently. “It does take a little dialing in due to the plants’ increased feeding regiment, but it is a small price to pay for all of the benefits we see,” adds Jacques. His success with the new technology is representative of a larger trend; more and more growers are beginning to implement LEDs in some form. Some claim the yield is less from LED lights during flowering. Maxx Wiley and Robert Manes, co-founders of Tall Trees LED Company based in Arizona, believe their technology is on par with the yields other growers are getting with different light sources. 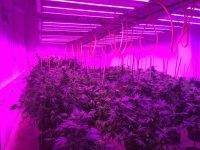 “We conducted heads-up tests with our 500-watt LEDs versus other 1000-watt HPS bulbs and have seen very impressive results,” says Wiley. “The plants under our lights were consistently getting more weight and more flowers; the flowers appeared smaller but were actually denser and heavier in reality.” Wiley’s company makes commercial LED luminaires that are IP 65 waterproof rated and he claims they never had any issues with failures. The technology uses no moving parts to cool the lights, just metal clad circuit boards, heat sinks and conductive thermal-bonding materials. “We have had customers run potency analyses and have found tremendous variation in plants grown with HPS,” says Wiley. “We see more compound production and more consistency crop-to-crop with our LED technology.” There are currently a handful of manufacturers bringing innovative designs to market. GS Thermal Solutions, based in Connecticut, manufactures 1000-watt LED fixtures that are liquid-cooled. 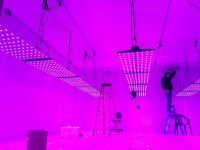 The company makes lights that are fully adjustable, so growers can dial in each spectrum of light intensity independently and tailor to specific strains as well as stages of growth. According to Rick Rhyins, vice president of sales at GS Thermal Solutions, the liquid cooling technology allows for a much longer lifetime of the LED and a much more efficient energy consumption. “Our technology addresses the shortcomings and previous problems with early generation LED models,” says Rhyins. Coupled with facility automation, GS Thermal Solutions uses a central control system to monitor cooling, light intensity and spectra, nutrient monitoring and feed control. Yet some are still skeptical of the LED lighting in today’s market and feel the technology is not there yet. Nic Easley, chief executive officer of Comprehensive Cannabis Consulting (3C), has brought over sixty cultivation operations to market and is hesitant to endorse the technology at this point. “I will never be an early adopter when it comes to new lighting technology and I feel we are at least a year out from seeing consistently efficient LED lighting,” says Easley. 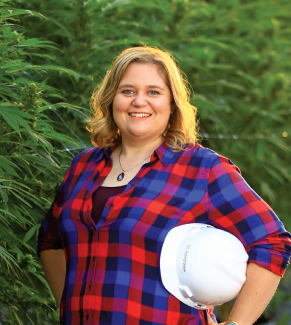 “There are still a lot of false claims out there and I want to wait until I see repeatable results on a small scale before I feel comfortable endorsing LED lights for cannabis cultivation.” While companies will continue to innovate lighting solutions for indoor cultivation, in many cases (but not all) it seems using the sun to grow cannabis would be more energy efficient. 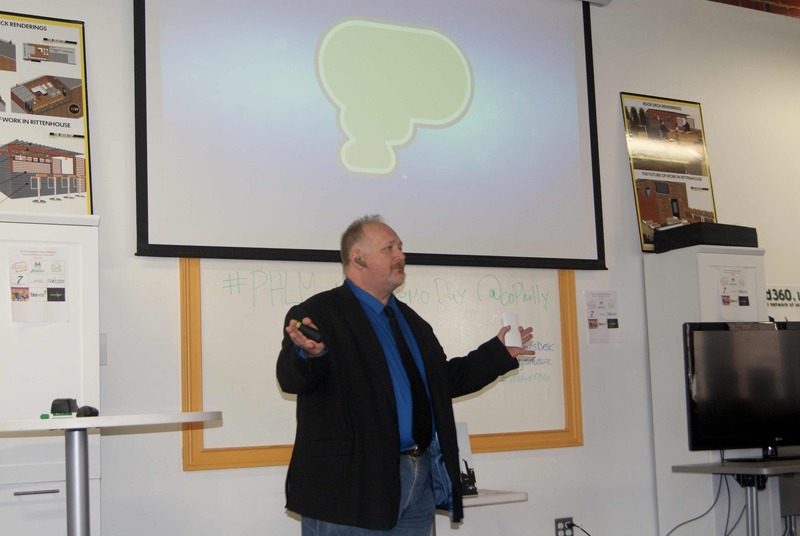 There are a few business accelerator programs that currently exist in the cannabis space, but Greenhouse Ventures (GHV), based in downtown Philadelphia, seeks to fill a gap in helping ancillary businesses get off the ground. Through a ten-week, 90-hour curriculum, program, Greenhouse Ventures assists startups by increasing their business model sophistication. 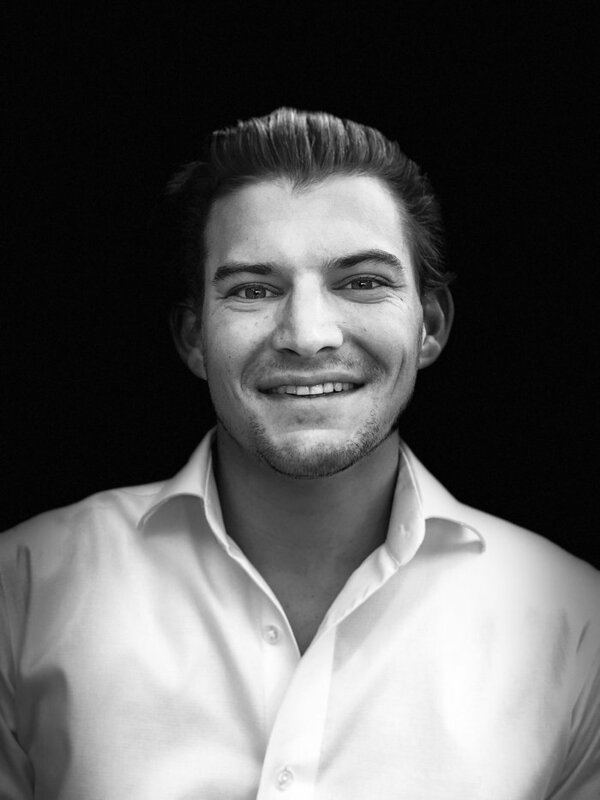 “The program consists of three hour sessions, three nights a week, for ten weeks, covering topics such as general business development, go-to-market strategy, growth strategy, capital formation, legal & financial due diligence, fundraising, valuation, and exit opportunities,” says Tyler Dautrich, founder of Greenhouse Ventures. Business startups in the program are paired with industry experts who serve as mentors providing advice, guidance and strategic introductions. The program culminates in a pitch event where the startups are given the opportunity to pitch potential investors and advisors in an effort to strategically advance their business model. According to Dautrich, Greenhouse Ventures’ overall mission is to increase the level of business sophistication of ancillary startups. They differentiate themselves from other startup accelerators like Canopy Boulder and MJIC’s Gateway by using a curriculum-driven program. Participants in the accelerator work closely with GHV staff, industry services providers and industry experts to learn exactly what they need to secure capital and get their business to the next stage. The program successfully completed its pilot semester in December of 2015 with three ancillary businesses in the cannabis industry. The second semester will launch this Spring in the end of April and Greenhouse Ventures will be accepting up to 10 ancillary companies for its second semester. The application window is currently open for the spring semester.